Wine lovers delight in a big holiday to bring out big wines! The beverages you serve take as much planning as any other part of a Thanksgiving celebration. Before we dive into the wine menu, don’t you wonder what the Pilgrims and the natives consumed in Plymouth at the first Thanksgiving that lasted for three days? It’s hard to imagine that they sailed from England, taking some sixty plus days to arrive and had any wine left. Rumor has it the ship had more beer aboard than wine. Wine experts recommend pairing a lighter red wine such as Pinot Noir or Gamay with turkey. White wine drinkers will select Riesling or a Gewürztraminer, perhaps even a Pinot Gris. Bubbly drinkers wave a white flag asking others to surrender alongside them and just pour champagne. It pairs well with everything! Salty, sweet, sour, bitter and savory. Because the menu has so many different flavors you should drink the wine you like best. It’s that simple. Microbrew beer is reaching lofty levels of satisfaction among beer consumers. Gone are the casual days of serving beers as pedestrian as Budweiser or Corona. You have a wide array of microbrew beers to choose from. Higgins Restaurant & Bar veteran Jason Button suggests you “Get little glasses to taste a lot of things. I’ll have a bunch of beers with a big long dinner and put out 5-6 beers to have sips with a lot of different things and, of course, share with everyone.” For further help to narrow down what to serve Button has compiled a specific pairing of beers to your Thanksgiving favorite foods. Don’t forget the kiddos or those who aren’t going to drink an alcoholic beverage. A fruity punch that isn’t too sweet served in a classic crystal punch bowl adds beauty and ease of self-service before a dinner begins. 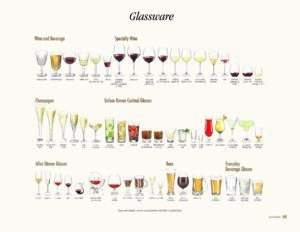 While others are dining with beer or wine, select a nice sparkling water and serve in the same style glass as the other diners have so a non-alcoholic drinking guest’s place setting looks the same as the others. 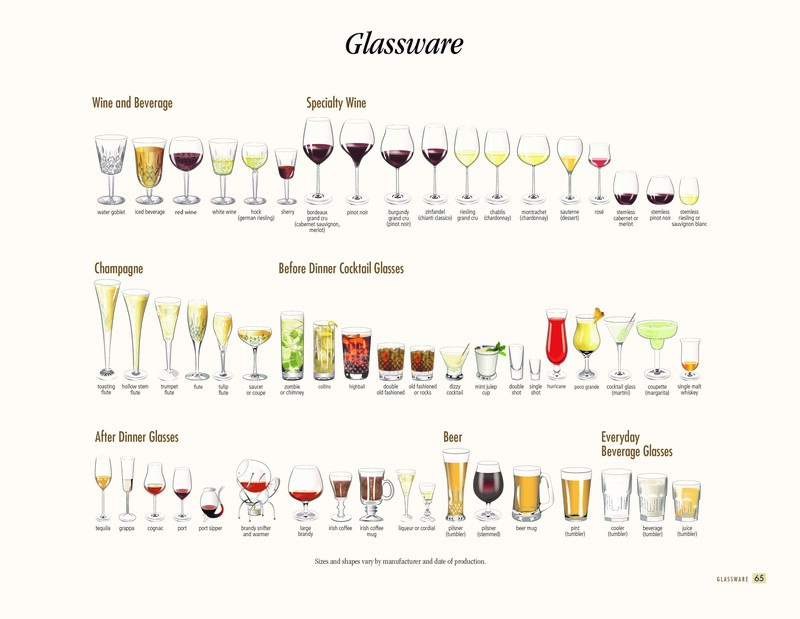 Wine and beers taste better when served in the appropriate glass. 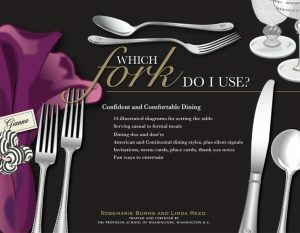 Below is page 65 from “Which Fork Do I Use?” and a quick reference guide. So many beverages to choose from and only one day of celebration. Maybe we should be like the Pilgrims and eat for three days. And simplify the drink menu – serve hard apple cider! The Pilgrims did.